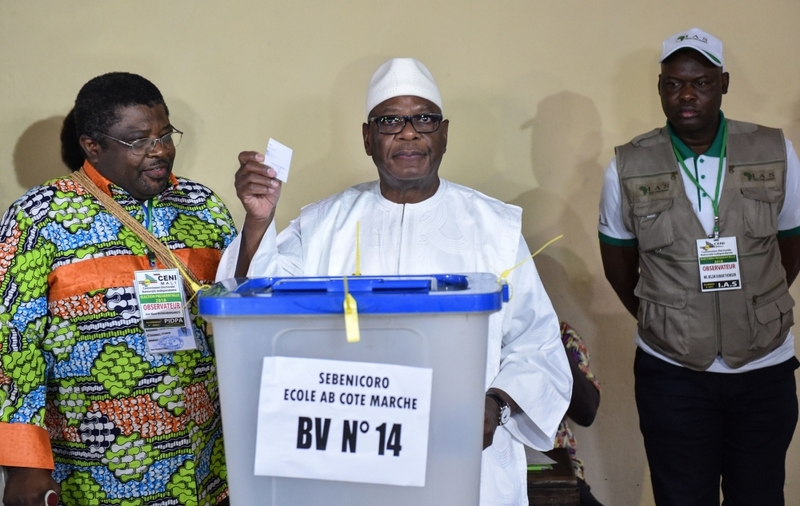 BAMAKO — Malians voted in a run-off presidential election on Sunday, with incumbent Ibrahim Boubacar Keita expected to beat the opposition challenger despite a surge in ethnic and militant violence during his tenure. The first round on July 29 was marred by armed attacks and other security incidents at about a fifth of polling places, as well as opposition charges of fraud. But as voting got underway, no serious incidents were reported. Soldiers ran body checks on voters in the capital Bamako as they waited in line under rainy skies to cast their ballots. Dramane Camara, 31, was the first to vote at one polling station in a school in the capital Bamako. The chaotic first round was a reminder that militants, some linked to Al-Qaeda and Daesh (the so-called IS), have regrouped since French troops intervened in 2013 to push them back. They are now expanding their influence across Mali’s desert north and into the fertile center. Their presence in the vast West African nation and their ability to spread violence to its neighbors has kept Mali high on the list of Western powers’ security concerns. Former colonial ruler France and the United States have deployed thousands of troops across the region. The 73-year-old Keita called for a peaceful day and urged people not respond to any provocation as he voted in Bamako on Sunday morning. “I pledge that all the difficulties we faced are now behind us,” he told cheering supporters. The government has stepped up security for the run-off, deploying an extra 6,000 troops on top of the 30,000 already on duty. Mopti region in central Mali, where most of the attacks in the first round took place, is a particular concern. Keita, who is seeking a second five-year term, took 41 percent of the vote in last month’s first round against nearly 18 percent for Soumalia Cisse, 68, a former finance minister and the main opposition leader.